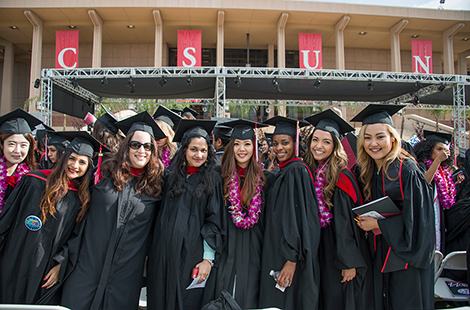 Nearly 10,000 graduates reached one of the greatest milestones of their lives during Commencement Week at CSUN. Read more about commencement. Five new graduates shared the long roads they traveled to earn their degrees. Read more about the graduates. CSUN alum Rodrigo Velez ’87 is one of the leaders in the fight to not only eliminate drugs from his native Ecuador but help addicts humanely. Read more about Rodrigo Velez. Wed. May 28, 10 a.m.
Wed. June 4, 6:30 p.m.
Jay Kvapil is the new dean of the Mike Curb College of Arts, Media and Communication. A respected ceramic artist, Kvapil takes his post Aug. 1. The CSU-leading group of 24 CSUN students were honored after spending the last semester interning on the Hill in Washington, D.C.
Dr. Ric Sletten made the 60-mile trek from his home to CSUN on a hot day in recognition of Ride Your Bike to Work Day.